Our Lady's Children Hospital Crumlin. NUI MAYNOOTH HAVE said that six of the 25 children treated after potentially inhaling chemical fumes at a swimming pool in NUI Maynooth were hospitalised. The university and Kildare Fire Service had earlier said that all 25 children had been taken to hospitalafter the scare. The children were taken to hospital as a “precaution” according to the university. The children, all aged under-9, were swimming in the campus pool at about 10.30am this morning when they became aware of the fumes and were taken outside and assessed by the university’s medical team. The fumes are believed to have entered the pool area through a ventilation system and originated from maintenance work that was being carried out nearby. 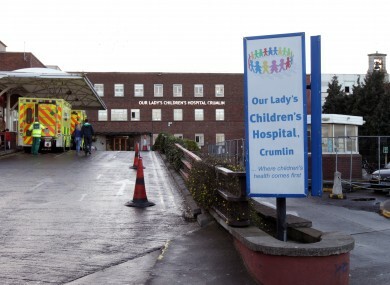 A number of ambulances were dispatched by the National Ambulance Service and the children were transferred to Crumlin and Tallaght Hospitals as a precautionary measure. None of the children are believed to have been seriously affected but six were hospitalised with the others returning to school. NUI Maynooth have confirmed that vapour from the swimming pool’s plant room entered the air conditioning system during a maintenance operation. The incident is now being investigated by NUI Maynooth and the Health and Safety Authority. Email “25 children treated after chemical fumes incident at swimming pool ”. Feedback on “25 children treated after chemical fumes incident at swimming pool ”.